Compass: The Study Bible for Navigating Your Life, is a study Bible edition of The Voice translation, a new translation released in 2012. 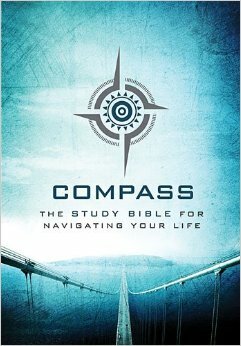 I received an advance copy of The Compass Bible to review. It will not be released until February 2014, but The Voice translation itself is available in other editions now. First, let me discuss the translation itself. Second, I will comment on the distinctions in this study edition. The Voice translation takes a unique approach in Bible translation, which makes it difficult to classify this as a translation or a paraphrase. Perhaps it’s best to say that it is a translation that is amplified with paraphrase. That is, the text has a fairly accurate translation, but then it inserts additional words into the text in italics for clarity and explanation. For example, Romans 10:9 is translated and amplified like this: “So if you believe deep in your heart that God raised Jesus from the pit of death and if you voice your allegiance by confessing the truth that ‘Jesus is Lord,’ then you will be saved!” Here’s another example that includes even more amplification, Psalm 23:5: “You spread out a table before me, provisions in the midst of attack from my enemies; You care for all my needs, anointing my head with soothing, fragrant oil, filling my cup again and again with Your grace.” In both of these verses, the text without italics is an accurate translation, but the text added in italics amplifies and explains the meaning of the verse. The advantage of this over other paraphrases is that the reader knows which part is translation, and which part is commentary. But there is more. On nearly every page, there is bracketed, bold text, giving background explanation of the history, culture and meaning of words and events in the passage. Elizabeth (disagreeing): No, We will name him John. Her Relatives (protesting): That name is found nowhere in your family. All of these features make The Voice a Bible that is well-suited to be heard, whether read aloud or heard in the reader’s mind. The Compass Bible is an edition of The Voice translation that adds some appropriate Bible-reading aids, primarily in the back, which include a 40-day reading retreat plan with suggestions for meditation and prayer, a 365-day reading plan through the whole Bible, an index of notes by topic, and maps. Other than a few Bible-reading aids, there is no difference between the text in the Compass Bible and other editions of The Voice translation, as they all include the topical notes in the text. The Compass Bible is printed on a less expensive paper, and retails for less than the regular edition. Taken together, the Compass edition of The Voice translation should make the Bible come alive to people who are not familiar with the Bible, and it should bring new insights to those who are familiar with the Bible. In the interest of full disclosure, let me state that I received a free copy of the Compass Bible for review, without any obligation to give a favorable review, and I did not receive any other compensation for writing this review. If you see a video ad below this post, I do not necessarily endorse the product.